Not wanting to post a recipe that I wasn’t very fond of, I thought of changing the flavour to one that I like. Unfortunately I don’t have lavender, and suddenly an idea struck me. I bought some loose Assam tea (black tea) leaves from Taiwan last year and they’re still lying around in my cupboard. Though Assam tea originates from India, it is a very popular tea of choice in Taiwan and is the main tea used in making bubble teas. The tea has a strong flavour, which I think will impart very well into the cake. The cake has a very nice and tender crumb, and every bite is filled with a very light tea flavour (imagine the taste of black tea with milk) and lemon. 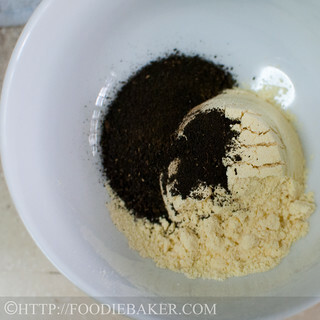 As I ground the tea leaves very finely in a food processor before infusing them, the tea leaves are all added into the batter, creating a beautifully speckled cake and you won’t get those bites of tea leaves in the cake – a win-win situation! It wasn’t very sweet as I reduced the sugar quite a bit so it’s a perfect treat for breakfast and for tea-time. I went a totally different route with the recipe, but I’m really glad to be able to find one that suits my liking a lot more. 🙂 Off to the step-by-step photos! 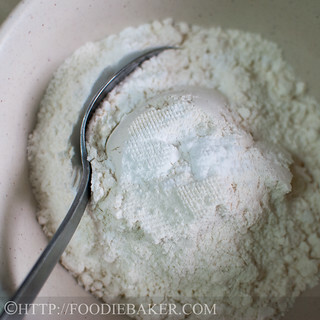 1) Combine flour, baking powder, baking soda and salt in a small bowl. 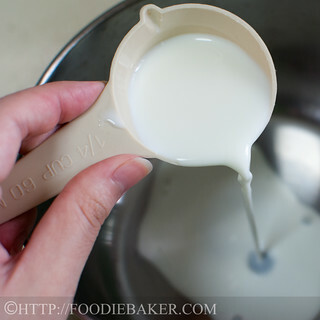 2) Measure milk in a small pot and bring it to a simmer, gently swirling the pot frequently. 3) While the milk is heating up, measure cornmeal and some finely ground tea leaves in a small bowl. 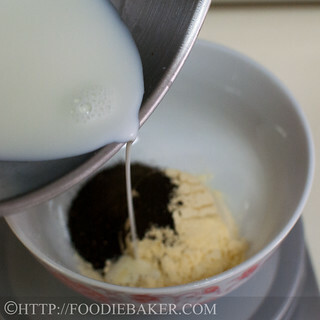 4) Pour the hot milk over the cornmeal and tea leaves, stirring to mix them together. 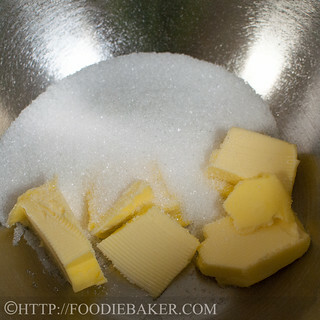 5) Sugar and softened butter - the usual suspects. 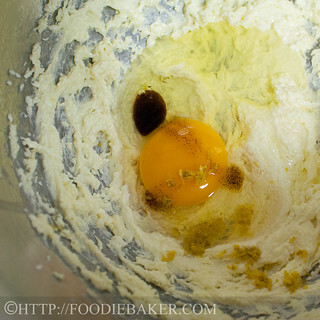 6) After creaming to fluffiness, add in egg, vanilla and lemon zest. 7) Sift in 1/3 of the flour mixture and beat in on slow speed. 8) While the beater is running on low speed, drizzle in 1/2 of the milk mixture. 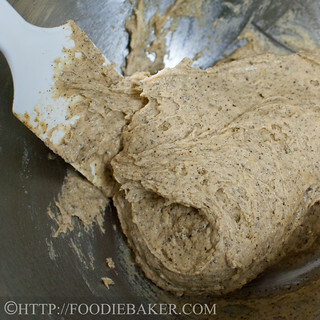 9) Sift in 1/2 of the remaining flour mixture and beat it in. 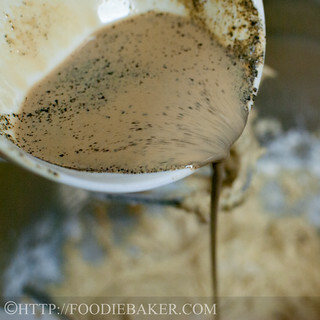 10) Add in the remaining milk mixture, remember to scrape in all the tea goodness! 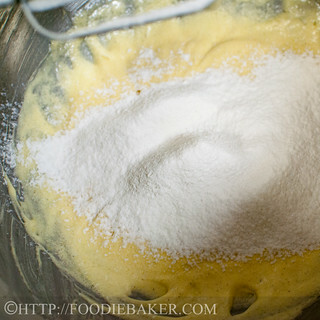 11) Stir in the remaining flour - look at how pretty the batter is! 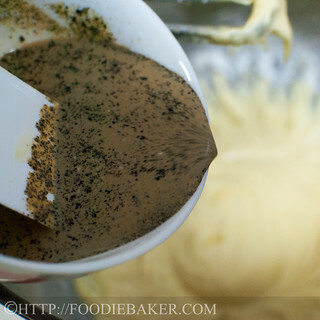 12) Divide the batter among cupcakes and bake until done! The Home Bakers – check out all fellow home bakers take on the cake here! As part of the rules, I’m not going to write down the full recipe here, please head over to Angela @ The Charmed Cupcake for the full recipe! 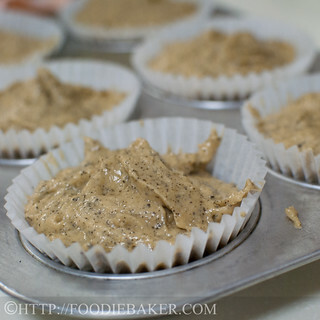 For the cupcake version, I used 1/4-cup ice cream scoop and divided them into 6 cupcakes. Bake them at 175 degrees Celsius for 15 to 18 minutes until a skewer inserted into the centre comes out clean. Let the cupcakes cool completely on the wire rack. Oh My! You got a winner there! Great idea to replace the rosemary with tea! Yum, this looks delicious! 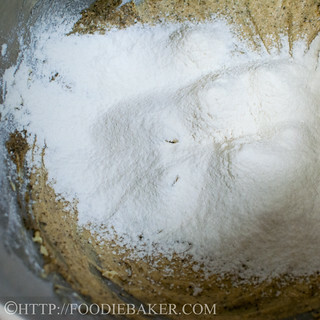 I love cornmeal and often use it to make skillet cakes, pancakes, and muffins. I’ve never tried with black tea though- can’t wait to try this out. Thanks for checking out Life Is Like A Dumpling! Way to go, Jasline! You didn’t care for the first attempt, so, you created something special. Good for you! Hmm, this sounds really yummy. I adore polenta but have never had it in cake form. 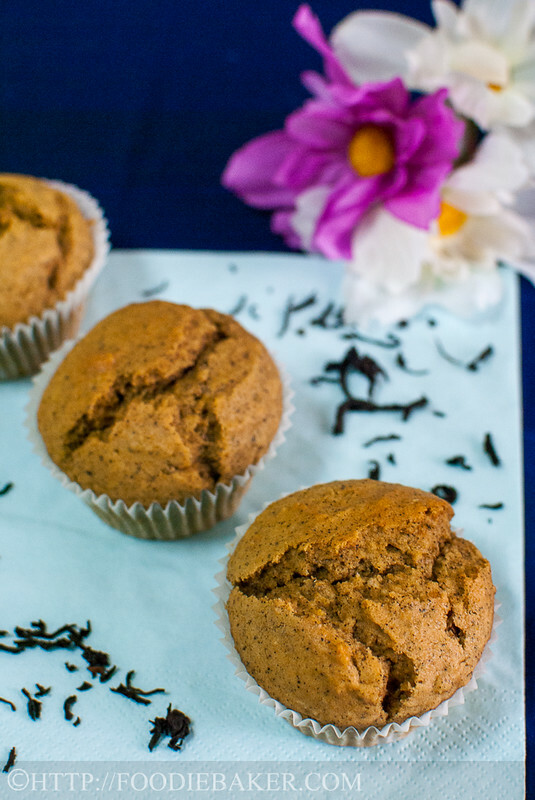 I have never really baked with tea before your little cakes look wonderful, cornmeal, lemon and tea sound to me like a perfect pairing, The cakes look moist and delicious. I’m so sorry you all didn’t like the Rosemary-lemon Polenta cake but thanks for giving it a go. 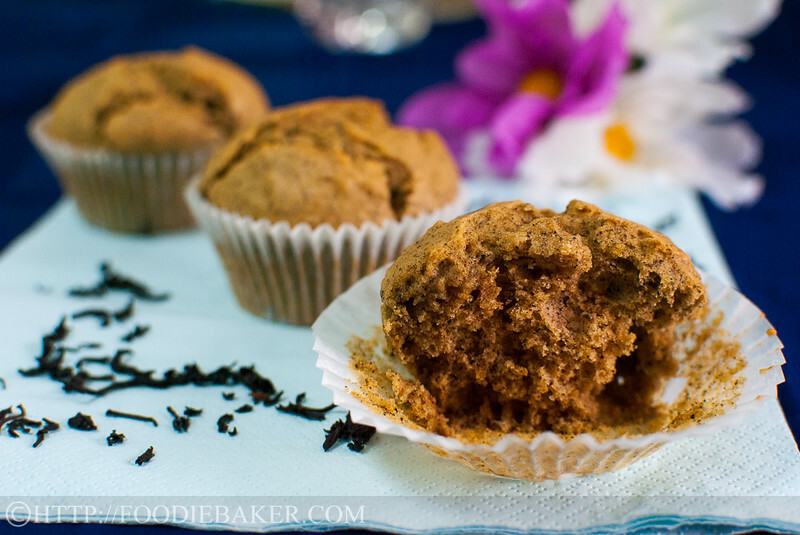 I love your black tea version of this recipe. 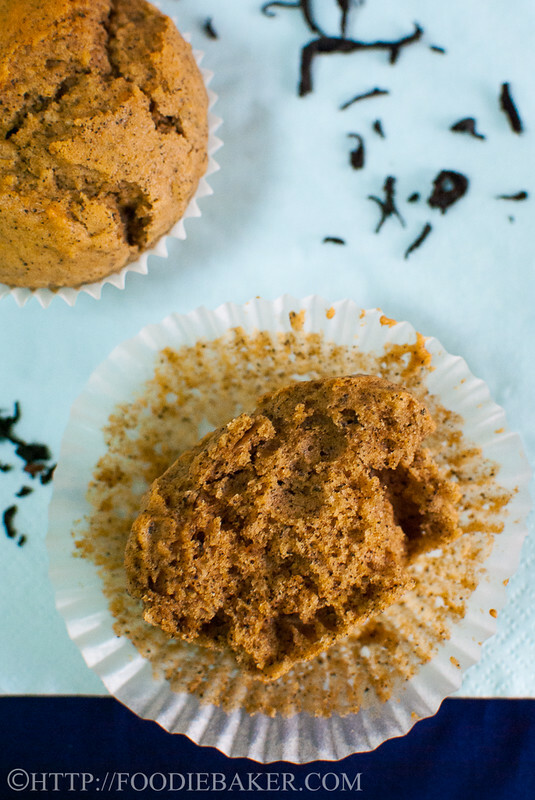 I’ve recently been hooked on baking with tea so I really love your take on this recipe & I’m glad your family is happy with this. 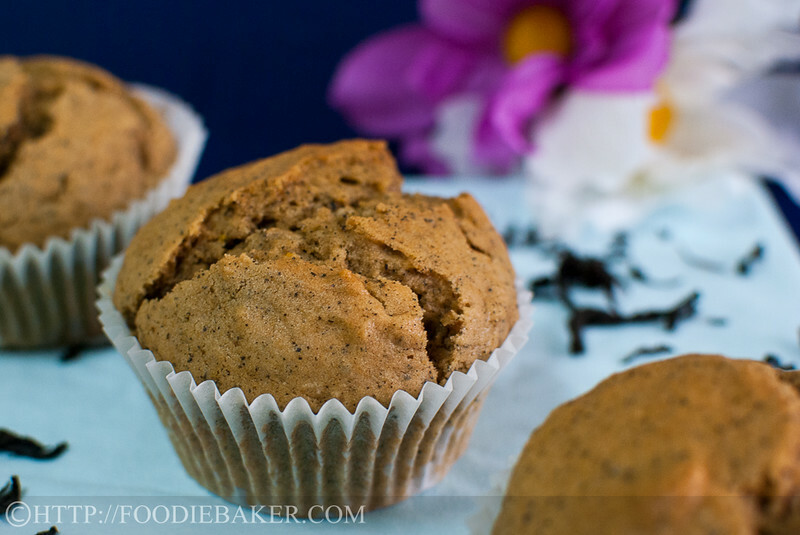 Your cupcakes look deliciously moist & a beautiful colour. Hmmm … this sounds very interesting with the black tea incorporated. This is a creative way of turning a herb infused cake to a tea cake! Lovely! The speckled effect of the powdered tea leaves makes the cake looks very pretty! Great job! And glad that you are able to bake it on time!